"One of the finest acoustic guitar innovators borne of the late '70s UK folk scene, was in Philadelphia early 2010, paying tribute to his good friend, the late Jack Rose, a mighty six-string alchemist in his own right, and a youngster wholly inspired by Chapman's critical recordings. While sharing in the good light of friendship backstage, we asked Michael if he'd ever recorded an LP of purely improvised guitar music. It seemed feasible, as the current state of acoustic guitar exploration was in equal measures inspired by both composition and improvisation. Chapman, along with Bert Jansch, John Renbourn, John Fahey et al, was a significant and historical informant for this young set. But he claimed to have never even entertained the notion of an LP of exclusively improvised playing. Anyone who has had the good fortune to hear Michael just take off in the middle of his songs and simply shred into zones of in-and-out-of-the-chakras stratosphere knows that such an idea could only be wildly welcomed. 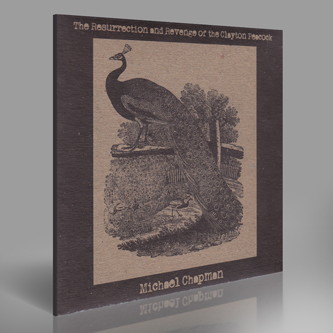 As it were, Michael got in touch within a week or so and said he was game, and here it is, The Resurrection And Revenge Of The Clayton Peacock, two sides of unbroken, idiosyncratic guitar improvisation that moves from neck-tapping harmonics into effects pedal kosmische into distinctly strange tone huzz. An odd and lovely, momentous session."